Translated by Juliet Winters Carpenter. 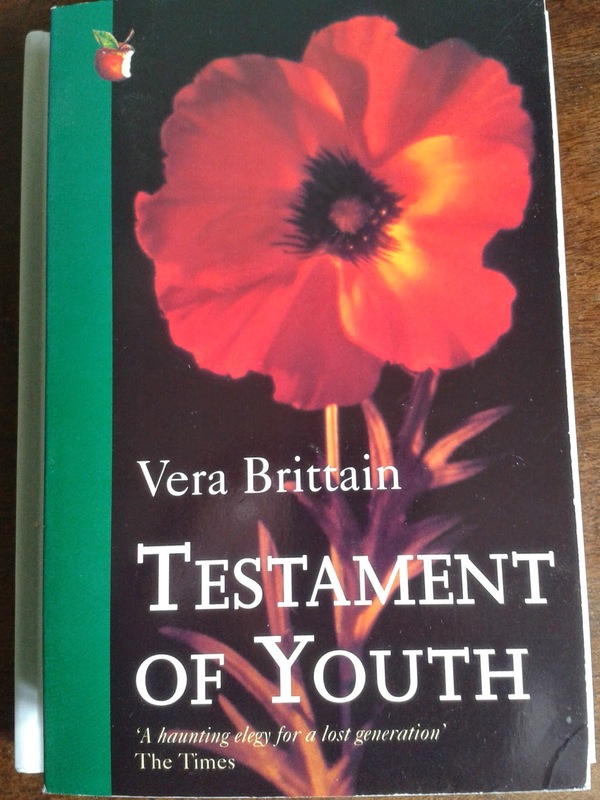 When this book turned up in my letter box I had no idea what to make of it - except that it was very pretty. It's a translation of an internationally acclaimed, best selling, collection of Japanese poems covering 'the discovery of new love, first heartache and the end of an affair' - which still left me at a bit if a loss, but it would have been rude not to take a look at it and once I started reading I didn't stop until it was finished. Annoyingly I managed to throw away the press release before I read the book, I have a dim memory that it had some useful information on it. Fortunately there is a useful afterword which expands on anything that would have been in the release. The story of 'Salad Anniversary' is in itself remarkable. 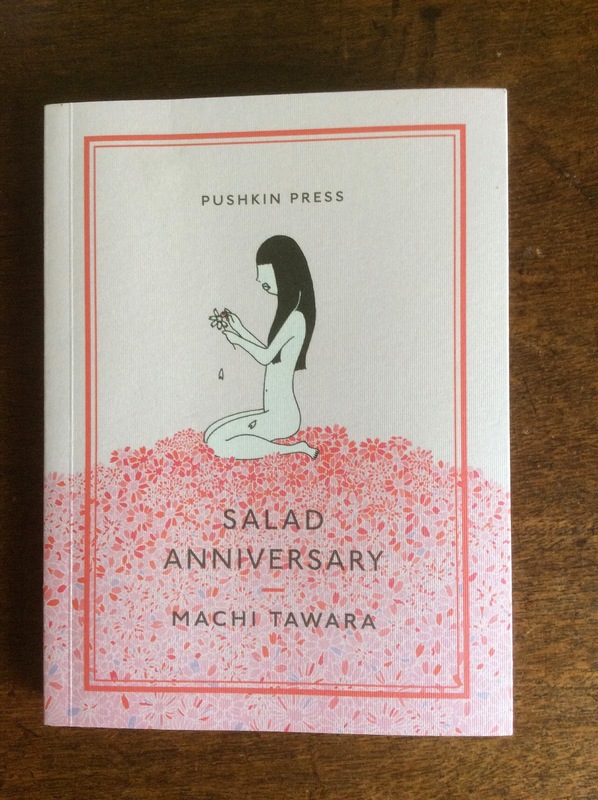 It's 1987 and a young teacher (26) Machi Tawara publishes her first collection of poems in tanka form. Tanka are short poems of 31 syllables, have a tradition that goes back well over a 1000 years, but had (I'm getting all this from Juliet Winters Carpenters afterword) become stale and conventional dealing as they traditionally did in set themes and an out of date, self consciously literary language. Tawara's collection changed all that, she managed to incorporate contemporary language without sacrificing traditional tanka virtues. So much so that the afterword (written in 1989) says 2500000 copies had already been sold and a phenomenon started. It seems incredible that a collection of poems would have this kind of impact, but it's profoundly encouraging to realise that it can happen. It works because the tone is cooly observational. We can all recognise the family relationships, progress of love affairs, and holiday emotions that Tawara shares, and that moment of recognition is immensely comforting. I've been procrastinating over writing about this book for about a week now and I'm still not sure how I'm going to do it without spoilers (let's see how that pans out). Normally I'm not bothered by spoilers; I like knowing what's going to happen in advance and then trying to work out how as the book unfolds. In this case however I feel spoilers really would spoil. Whilst I wrestle with that particular problem... 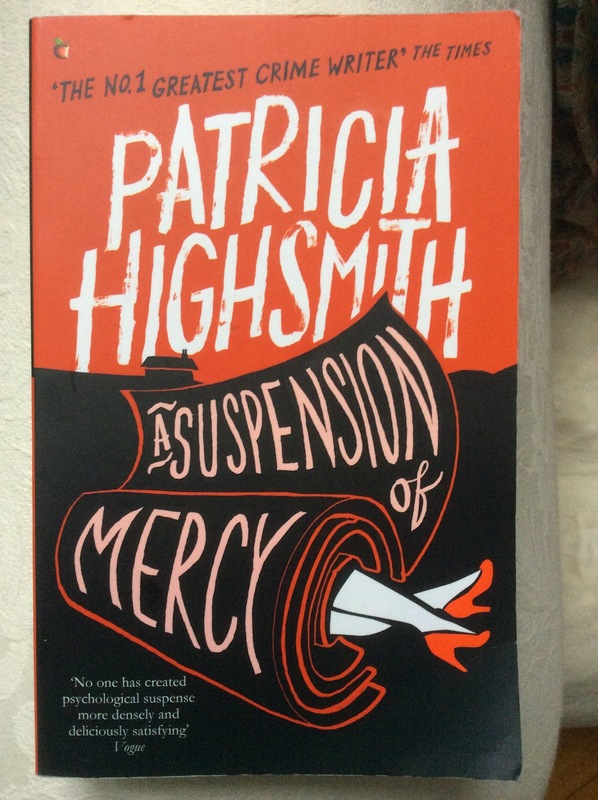 This is the first Highsmith I've read despite meaning to have tried her for very many years. I've seen a couple of the Ripley films and enjoyed them very much, had her recommended a few times, gone as far as to buy at least one book, but it was a short story in 'Troubled Daughters, Twisted Wives' that actually did the trick. After that seeing that Virago were reprinting her at this end of the year it was only a matter of time. So here I am with 'A Suspension of Mercy' in hand, full of enthusiasm for it, and feeling particularly tongue tied. Sydney and Alicia Bartleby met when Alicia was visiting New York, after a relatively short time they've married, with the qualified approval of her family, and they've moved to the UK. Thanks to the generosity of Alicia's family they've bought a house and are partly living on Alicia's private income of £50 a month (the book was written in 1965) and partly money Sydney has from a couple of published novels back in America. Alicia paints abstracts (I imagine work which is competent rather than good) and Sydney is unsuccessfully trying to get a publisher for a 3rd novel and sell some scripts for television which he writes with his friend Alex. Their house is in the middle of nowhere and on the whole the marriage is foundering a little bit, perhaps because they spend so much time together. It's brilliant, tightly plotted, unexpected, tense, confusing (in a good way), and thoroughly satisfactory in every respect. I'm delighted I've got 2 more waiting for me. Now we're in the last week of November it's definitely alright to talk about festive preparations, mine continue apace. The Christmas cakes are baked, the puddings boiled, the chutney maturing - along with mincemeat, cranberry gin has been bottled, and I've started the Candied oranges. I'm really going for it with the homemade thing. There are a lot of advantages to making presents if you like that sort if thing, the first being that if you like that sort of thing it's fun. From a financial point of view it's easy to manage over a few months, and in my circle at least not many of us actually need much. Not things that we can afford to buy each other anyway (I might be in want of a new oven soon, the washing machine is on it's last legs, and I'd quite like my bathroom ceiling replaced and the tiles done) and we all have enough general stuff. Edible gifts, or drinkable ones, on the other hand are generally useful. With all the coming and going someone's bound to eat/drink it at some point. 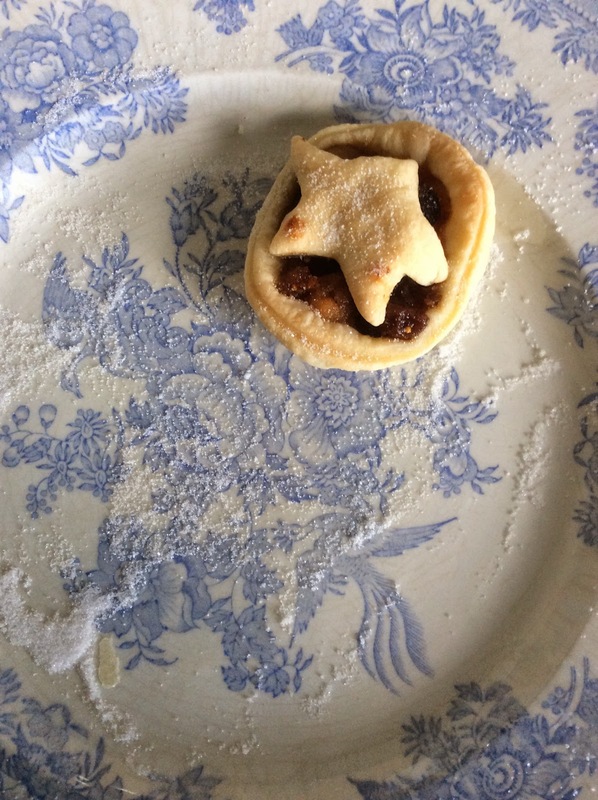 I will also say that after 15 years in retail I regard the festive season with a more than is healthy amount of cynicism; I'm not yet in the least bit cynical about baking so it helps redress the balance and gives me some rituals I can enjoy. That's important to me, I have neither children of my own or nieces and nephews. 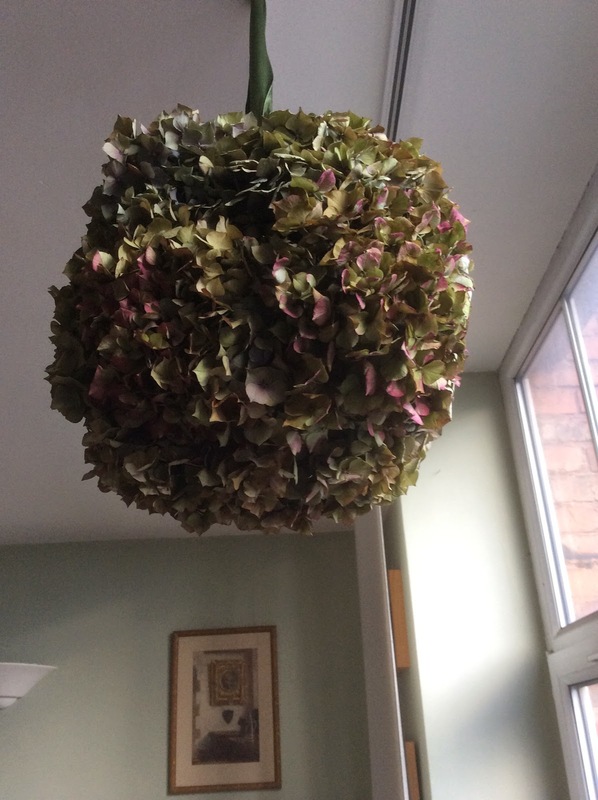 My partner and I have different family and work commitments to meet over Christmas so have never yet spent 1 together, and now my grandparents have gone there's no clan gathering (which, to be fair, were never much fun as my grandmother didn't really like having people in the house and my grandfather only emerged from the seclusion of his private sitting room to eat). It would be easy to ignore it all, but go that route and where's the joy? 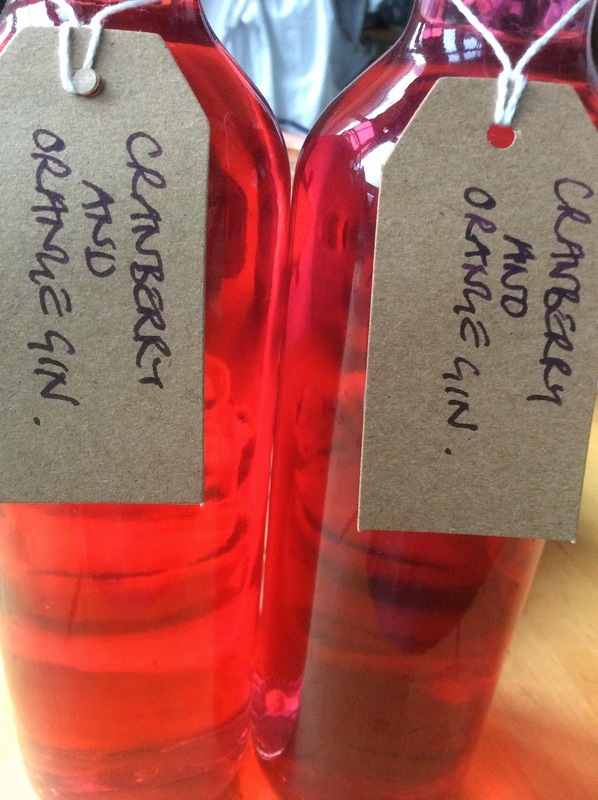 Meanwhile I've been unsuccessfully searching for a panatonne recipe which looks like it isn't a massive faff to make, tastes the way I expect it to, and isn't for an industrial quantity and successfully making cranberry gin. I missed the damsons this year and find sloe gin a bit to medicinal so Diana Henry's suggestion of a cranberry version was timely, especially after I'd wildly over estimated how many I would need for chutney making purposes. 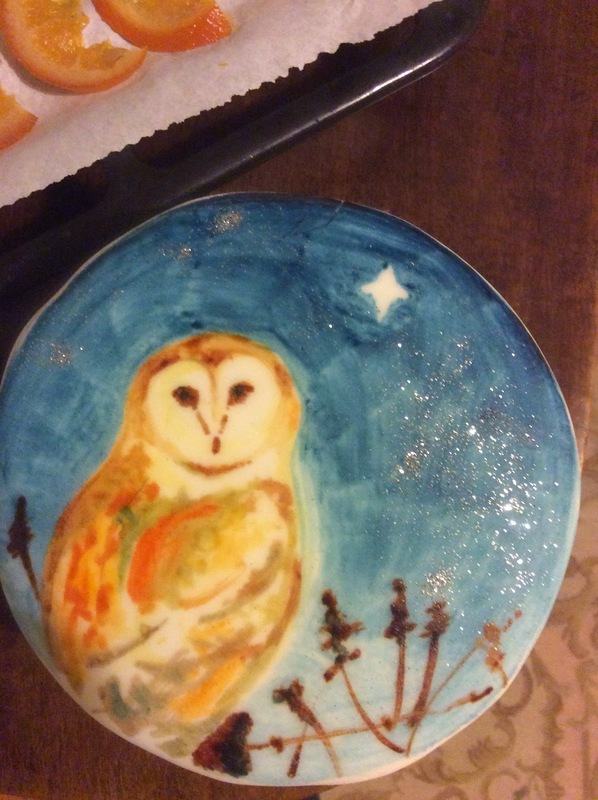 I added some orange peel and used pine scented sugar - the sugar purely because I realised I had no idea what to do with it having made it, and it wasn't going to fight with the gin. I've bottled it after only 2 weeks as I'm happy with the flavour now, it's going to be brilliant either with soda water as a long drink or in possibly in some sort of cocktail (though the later will almost certainly mean a hellish hangover). If you want to find Heyer in a bookshop chances are she'll be in romantic fiction which has never seemed particularly appropriate to me and even less so now when romantic fiction is generally somewhat more explicit than anything Heyer would have thought of writing. I've come to think of as much more an adventure stories for girls type if writer. Inspired by the Vulpes Libris Heyer week I thought I'd devote the weekend to rereading a favourite rather than struggling with how to write about a Patricia Highsmith without giving away to many spoilers. Spoilers for a Heyer book aren't such an issue, partly because I assume that most people reading this will probably be familiar with her books already, but mostly because the joy is in the humour and detail of her work as much as it is the plot. 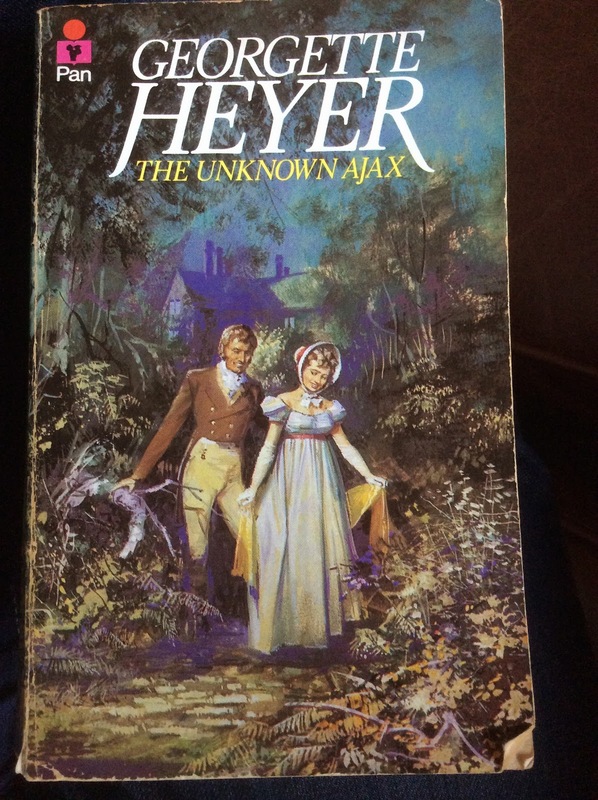 'The Unknown Ajax' is from reasonably late in her career when the quality can be a little bit patchy (the one thing I don't like about Heyer is when she goes over the top with contemporary slang) but this remains one of my favourites. I discovered Heyer when I was about 11 or 12 thanks to the suggestion of an excellent English teacher, devoured all her books in a mad binge over the next year or so, and reread them many times in my early teens. Over the years I've periodically turned to her for a comfortably entertaining read, and just as regularly been surprised by what I find. My 12 year old self was more caught up in the romance - never sealed by anything more racy than a kiss, and only then at the very end - and took the rest for granted. 20 something me turned to these books in much the same frame if mind as I would an old black and white film on a Sunday afternoon. 40 year old me is delighted by the way that Heyer still stands up, though more aware of her class consciousness and ingrained snobbery. There is a romance in 'The Unknown Ajax', it centres around the hero, Major Hugh Darracott - lately returned from the wars to find he's heir to a title, a falling down house, and all but bankrupt estates, and his cousin Anthea. None of the Darracott's can be convinced that Hugh, who they've refused to acknowledge/didn't know about isn't delighted by the prospect of joining their ranks. He for his part plans on escaping as soon as he can but finds himself increasingly taken with Anthea. She is a typical enough Heyer heroine, attractive, intelligent, capable, certainly aware of the restrictions placed on her by society and arguably slightly resentful of them, and fortunately gifted with a sense of humour. Hugh in turn is kind, honourable, trustworthy, and equally intelligent, as well as having that all important sense of humour. If nothing else an impressionable 12 year old can learn that mutual respect and shared humour are the bedrock of a good relationship. Beyond that there isn't much to say, there are some nice set piece exchanges between the pair and on Anthea's part a realisation that Hugh's presence is both comforting and disturbing in equal measure but she doesn't really figure that much in the story. Instead what we have is a good old fashioned thriller type tale of smuggling. Anthea's brother, Richmond may be more involved than his family like to think, the family itself, held in thrall to a patriarch as autocratic as he is unreasonable are none of them very happy. The end result is an equal mix of genuine tension and farce as Hugh attempts to sort out a situation that could conceivably end with a hanging. 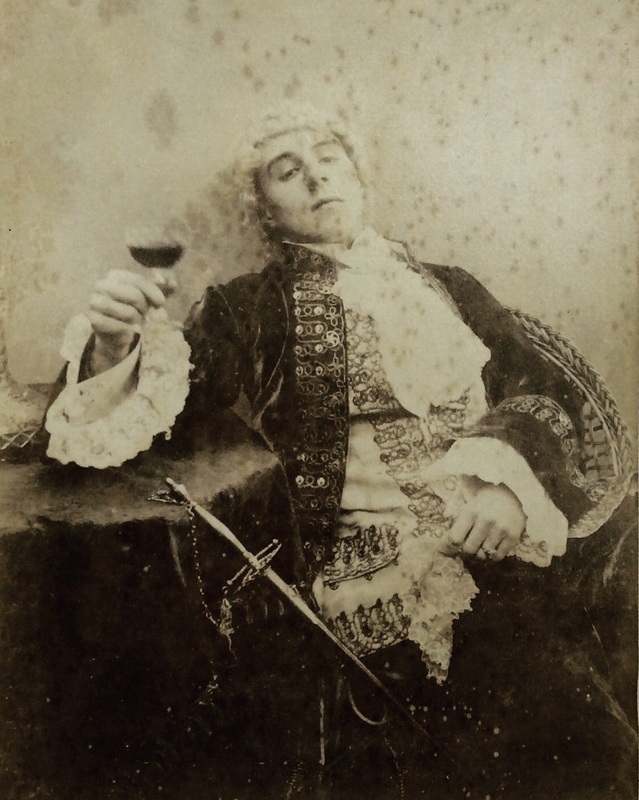 Heyer is mistress of never quite overdoing it, everything is just feasible right down to the exciseman maintaining a strong suspicion that he's been had. Heyer might not be for everyone but if you think she's just a romance writer think again (though I admit the truly horrible cover on my copy does nothing to dispel the illusion). I thought that the upside to shingles would be time to read - for what else can you do in between absorbing antivirals, ibuprofen,and calamine lotion? Depressingly there was no upside to shingles, the rash is so irritating that sleep and concentration are both hard to come by, for whatever reason I failed to read much. The best part of a week at home valiantly trying not to scratch mostly made me wonder how it's possible to fit work and everything else into a week. Between domestic chores, scrutinising bills, a futile attempt to reduce the number of rogue books in any meaningful way (I managed to clear out about 20, a mix of unsolicited review copies it was time to accept I would never read, a couple of duplicates, and a very few I knew I'd never read again) and looking for the strongest possible non prescription pain killers time just vanished. If I didn't need the money I'm pretty sure I could find a better use for the 50 odd hours that having a job takes out of a week. I do need the money though, not least to fund my baking habit. Thanks to the consumer heaven that is Costco the several kilos of dried fruit and nuts I've bought in the last couple of months (possibly in excess of 20 kilos, which is probably quite a lot) haven't broken the bank (or my back hauling them up to my flat). 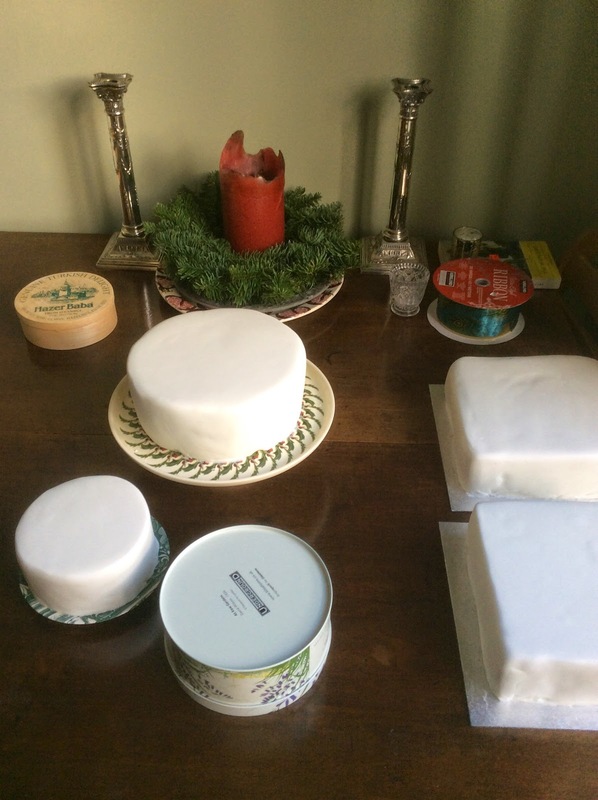 It also means that after 18 jars of mincemeat, 12 of chutney, and 10 assorted fruit cakes there was enough left over to make Christmas puddings with. 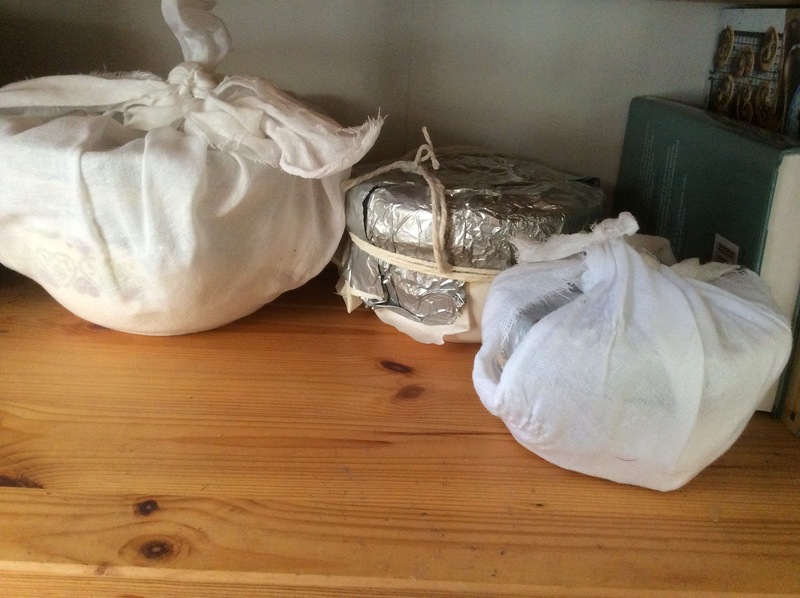 Christmas puddings are another thing that I've half meant to make for years but never quite got round to. Turns out they're a sensible project whilst feeling a bit ill - plenty of pottering around getting ingredients together, not very long spent on mixing it altogether (times like this I love my kitchen aid with a passion) and then ignore them whilst they boil/steam away. It's the cooking time that's always put me off in the past. Three (or more) hours on the day you make the pudding is long enough if you're struggling to devote what will basically be a whole day to your kitchen, but another 3 hours on the day of eating - well it's a commitment, especially when you can buy and microwave one in minutes. I'm quite excited by these puddings though - I made 3, from 2 different recipes in Dan Lepard's 'Short & Sweet'. 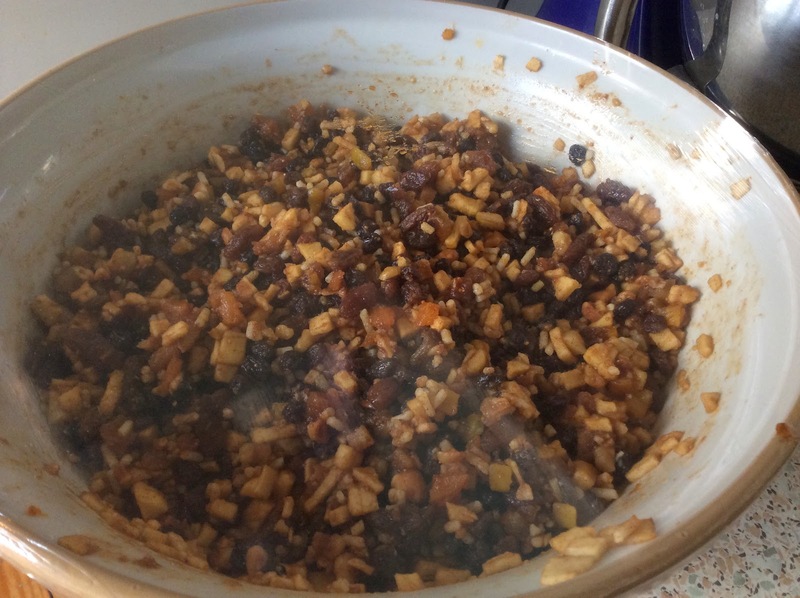 A large one which faithfully follows the Simple Christmas pudding recipe (apart from some added alcohol) which is apparently a 1930's recipe, and 2 smaller ones from the Plum plum pudding recipe (with a few liberties taken). Making 3 was mostly to do with using up odds and ends of ingredients, partly to experiment with recipes and techniques. Two were simmered, 1 went in the upper level of a veg steamer - which somehow seems like less trouble. Now it's just a question of waiting to see what they're like which is a little bit nerve racking. 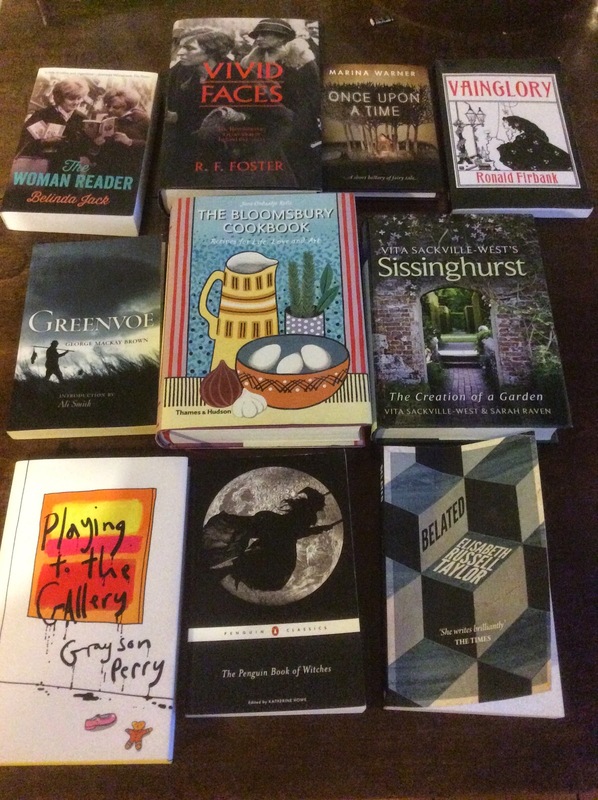 On my last visit to London I gave in to temptation (if that sounds in anyway as if I tried to resist temptation it's misleading) and visited the Persephone book shop in search of cook books. 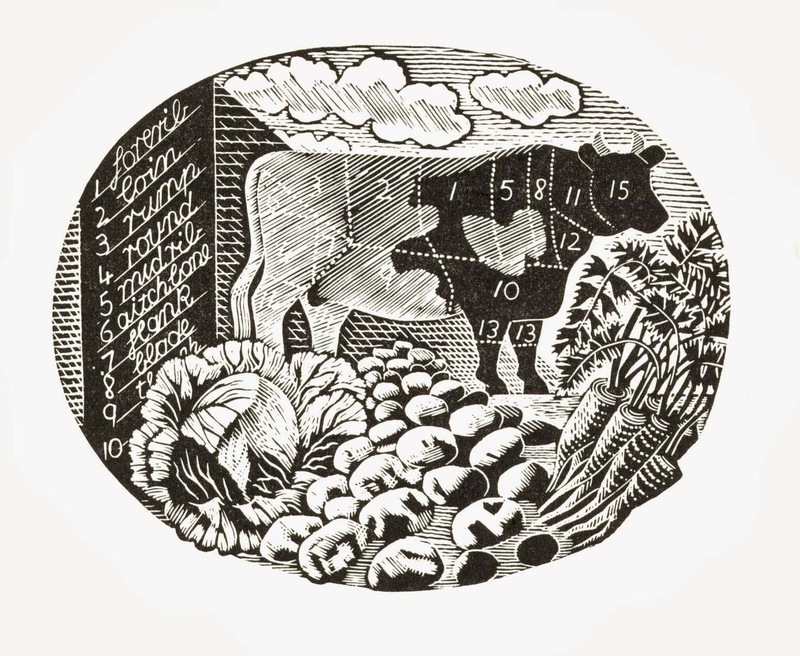 Specifically the latest one, Ambrose Heath's 'The Country Life Cookbook'. My love of old cookbooks is a thing apart from my love of new cookbooks. New/ contemporary ones are for cooking from, old - or more specifically reprinted ones in this case - are for reading. This particular book has an excellent introduction by Simon Hopkinson which touches on why that is for me. Older cookbooks, certainly the majority I've seen anyway, tend to be light in instructions. For someone bought up on detailed instructions that can be intimidating. I consider myself a reasonably confidant cook but my knowledge is patchy at best. Armed with precise orders I'll have a go, but describe an oven as slack or sharp and I begin to worry. It's not that Heath is vague, it's just that he's clearly writing for people who know what they're about, 1937 was after all still a time when employing a cook would not have seemed an outrageous luxury. However even in 1937 things weren't what they used to be so Heath is also writing with a view to the servant problem. These, he contends, are recipes which won't tax the time or ingenuity of your cook, as proof they're all things he's made himself. There's another reason why I find myself primarily reading these books rather than cooking from them, tastes have changed somewhat over time and so a lot of what I find in these books doesn't especially appeal. Lettuce A L'Etouffee may be delightful, but I'm not sure I'm willing to stew one for 45 minutes with onions, sugar, butter and a bouquet garni to find out, and as for the next recipe 'Brazilian Pudding'... It starts with the optimistic statement that "Even those who do not like tapioca will not despise this version of it." Tripes A La Dauphinoise says it "demands a bottle of wine and a little brandy" some may feel that's a good place to stop (I'm not a fan of tripe but actually this recipe does sound good). To be fair to Mr Heath and the 1930's cook I was specifically looking for things I thought might horrify my travel companion when I found those recipes. The book is also full of things we would like along with some very useful information and a fascinating insight into pre war kitchens. 'The Country Life Cookbook' is also part gardening book, working on the reasonable assumption that the country housewife will have a garden (and also a gardener) there is advice as to what needs to be done in any given month with a view to keeping a varied table. It's obviously a seasonal guide as well - in the 1930's there was no other option but it's something I'm a bit evangelical about so the table of seasonal fruit and veg at the back is really handy. The insight bit comes in the list of ingredients. It doesn't really surprise me how well stocked the 1930's kitchen was with spices. It's interesting to see lots of mentions of garlic and olive oil - a reminder that pre and post war food were very different, however what really surprises me is how many herbs are mentioned. It shouldn't really, but then how many of us now have access to a really comprehensive selection of fresh herbs? 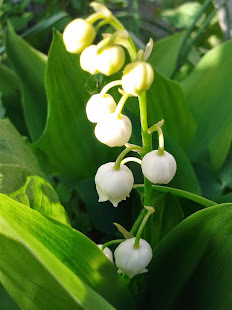 When I have access to a garden they tend to be what I plant, mostly because I have romantic ideas about it, and I'm an easy sell for any herb based cookbook which encourages me to use them, but even so I don't cook with them half as much as I'd like to. At home in a provincial city my options are limited - this feels like a part of our food heritage that's still a little neglected. Finally the real charm of this book is Heath himself. He's delightful to read; chatty and informative but always concise, full of enthusiasms, and with a delightful turn of phrase this really is a book to be enjoyed at leisure. It would make a perfect stocking filler or general gift for anyone of a foody turn of mind, or as in my case a very useful self indulgence. It doesn't take much to make me cry, actually so little that it's embarrassing - Christmas adverts do it, euro Disney did it (though perhaps for different reasons), Victorian paintings of sad eyed dogs mourning their lost masters do it. I don't know why I do this, it's a reaction like blushing - which I also do easily, and not necessarily based on real emotion, but anything with even a hint of pathos will have my eyes welling up and voice wobbling. 'Aunt Sass' was a three tissue job. P. L. Travers was the author of Mary Poppins (which reduced a previous boss to tears along with his father and brother on a regular basis as it called to mind their grandmother). I think I might be like a lot of people in that I only know the film version - which along with 'The Sound of Music' was an inescapable part of childhood (is it still?). Having read 'Aunt Sass' I think I might need to investigate the book, it might not be quite what I expect. Travers wrote the 3 stories in this collection as Christmas gifts through the 1940's, reading them reinforces a chance conversation with a woman who I was browsing Christmas cards next to earlier this month. We were both irritated by Christmassy music and both felt that whilst October/ November where perfectly reasonable times to make preparations in the way of cake baking and pudding making, even of putting aside gifts and choosing cards whilst the choice is still appealing, we both resent all the adverts that tell us it's now Christmas. Quite clearly it isn't! 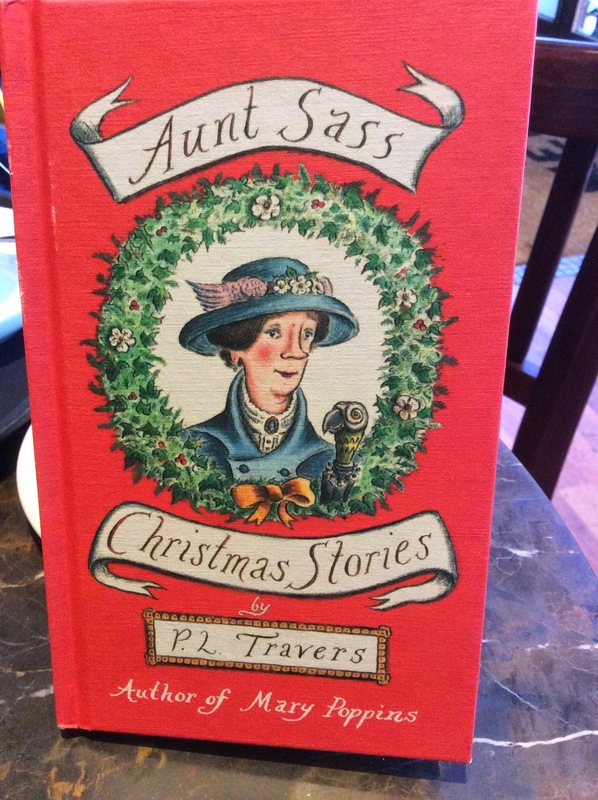 In 'Aunt Sass' Travers recalls a beloved if formidable great aunt. The matriarch and head of the family even though she never had children of her own, who provided unstinting support for all around her. Aunt Sass is a sometimes contradictory figure who receives a wonderful eulogy here. It's not a Christmassy account in any way but is very much in the spirit of taking time to think of and acknowledge those you love. The second story deals with Ah Wong, a Chinese cook the children try and convert to Christianity (unsuccessfully). For the most part it's a humorous recollection of someone met and liked in childhood but there is a sort of sequel to the events of childhood that turns it into something more. The final story tells of Johnny Delaney, and is the most obviously Christmassy. It's also the one that feels most like a story often told. There is a fairy tale quality to it and enough sentiment to really tip me over the edge into what can only be described as sobs. Johnny Delaney is a jockey, groom, coachman, carpenter, and suffragette parent to this band of children. He's contrary, grim, a champion swearer, heavy drinker, and object of devotion for the family. He's also gifted with a sort of second sight and a life's work to complete. I've come down with shingles which is a new (but unpleasant) experience. I feel like I've been thrown in a patch of stinging nettles which in turn is making me irritable, tearful, and making it hard to concentrate on things for long. It seems wise to stay at home for a few days smothered in calamine lotion and trying to de stress a bit. The medlars I scrumped a week or so back appeared to have successfully bletted (they were brown and squishy at any rate and one of them was definitely oozing) so turning them into jelly was a job not to be put off, not least because I kind of wanted them out the way. Rotting fruit around the place is a bit disconcerting, but then everything about the medlars has been disconcerting so far. I dutifully boiled them up - they do indeed smell like wet wood as they cook, it's an aroma that successfully blotted out the rather more appealing smell of the Christmas chutney I'd made a few days before and which hadn't quite disappeared. After that it was into the jelly bag for a night of dripping into waiting pan - even after a thorough boiling and at a point of disintegration (though with hindsight I should perhaps have waited for total disintegration) they didn't yield a lot of liquid. Annoyingly at this point I managed to drop the contents of the jelly bag all over a chair and then the floor. 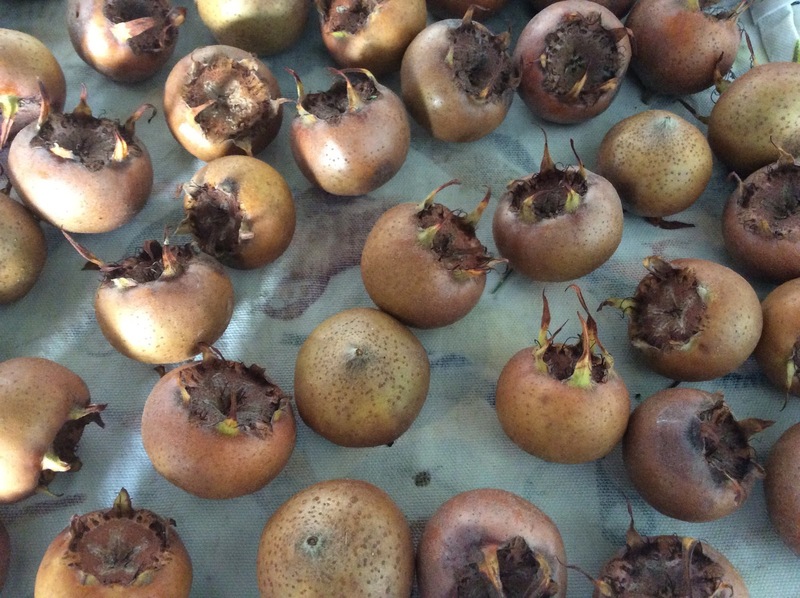 Very squishy medlar remains are not a joy to clean up. The upside of the small yield was that I could use a small pan and everything happened really quickly. The maybe a downside is that the 2 lemons the recipe called for were extremely juicy so the overall result is lemony. It's a pleasant flavour but I'm not sure how much of it is medlar. I also panicked a bit about reaching setting point so decided far to late to chuck a bit of powdered pectin in the pan forgetting that it would just turn into jelly lumps with the result that my two jars of otherwise attractive gold and russet tinted jelly are quite cloudy. This book came to me as a review copy, I said yes to it because the blurb reminded me of both Shirley Jackson's 'The Haunting of Hill House' and Rumer Godden's 'A Fugue in Time'. 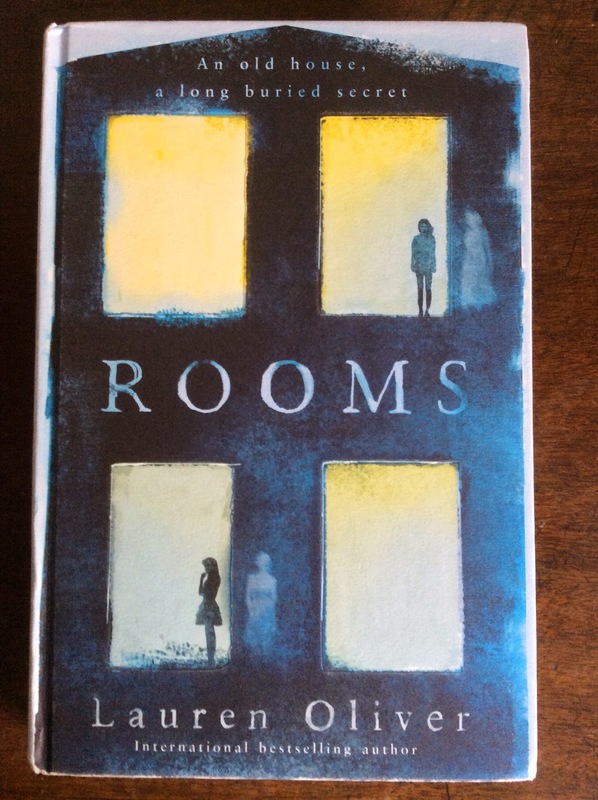 Two brilliant books by two of my favourite authors; with expectations like that 'Rooms' was always going to have a lot to live up to. 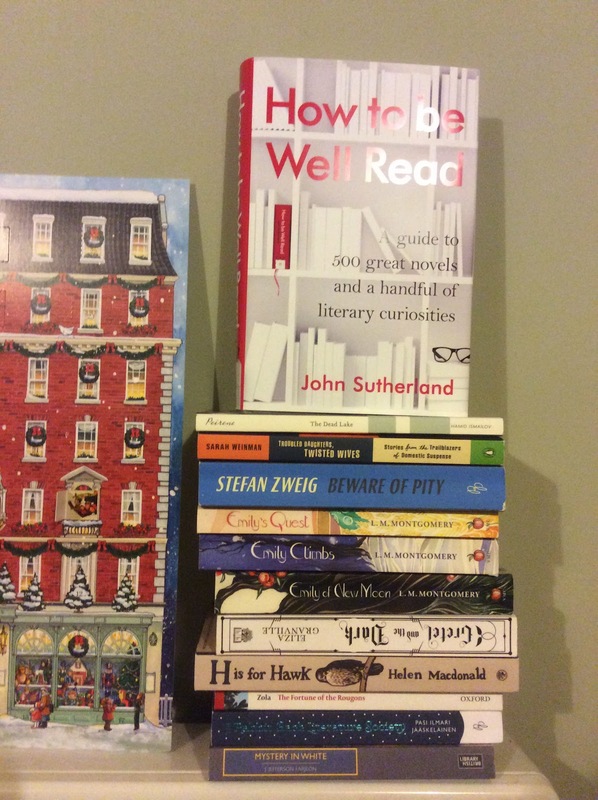 In the end it didn't really measure up to the competition - though honestly I don't suppose many books could. It's billed as a chilling ghost story - which it is, there are bits which really did give me the creeps. Richard Walker is dying, and as well as the nurses who are payed to watch over him there's also Alice and Sandra - or what's left of them. Both Alice and Sandra died in the house, neither have ever moved on, instead they've become a part of the place - the house is their body through which they feel every vibration and they in turn are it's judgemental consciousness observing the living. When Richard finally dies his family - Caroline, the alcoholic ex wife, Minna a grown up daughter with a compulsion to sleep with every man who crosses her path, and Trenton, the son who only just survived a terrible car accident all descend on the house. None of them are very happy in each other's company, all have things to hide, and all three of them are damaged. So damaged that it's hard to empathise with any of them, and for me that's one of the weaknesses of the book - I didn't like anybody enough to care what happened or why they were the way they were. Having run through the 100 odd jam jars I bought in September it seems it's time to knock the preserving on the head for a while. Fortunately there was a theatre trip planned - not just as a distraction from cooking things - to see 'The Witch of Edmonton' at Stratford. We decided to get tickets quite late on for this so there weren't many available seats, so few that we ended up with £5 standing spots which are, despite limited visibility at times, a bargain. I didn't know anything about this play beforehand (shame on me for not looking it up in time) and the RSC programmes have stopped giving a full synopsis so I had no idea what to expect which made it all exceptionally exciting. 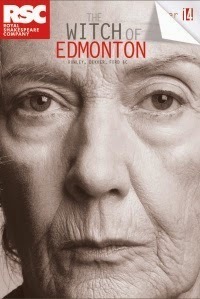 'The Witch of Edmonton' had at least 3 authors - Rowley, Dekket, and Ford, there is also an etc which suggests there may gave been a few more glands in the plot/s. It's apparently generally agreed that each of the 3 named writers were responsible for 1 of the 3 specific plotlines with Dekker responsible for the Mother Sawyer/ dog scenes, Rowley doing the comedy section, and Ford taking another plot involving a bigamous marriage and murder. I've been going to Stratford to see plays since school days - so for the best part of 25 years and have seen some brilliant stuff there, most of it in The Swan which is a theatre I've come to love for its general atmosphere - the more I go the more I'm impressed by what the set designers do. In this case it felt particularly inspired. 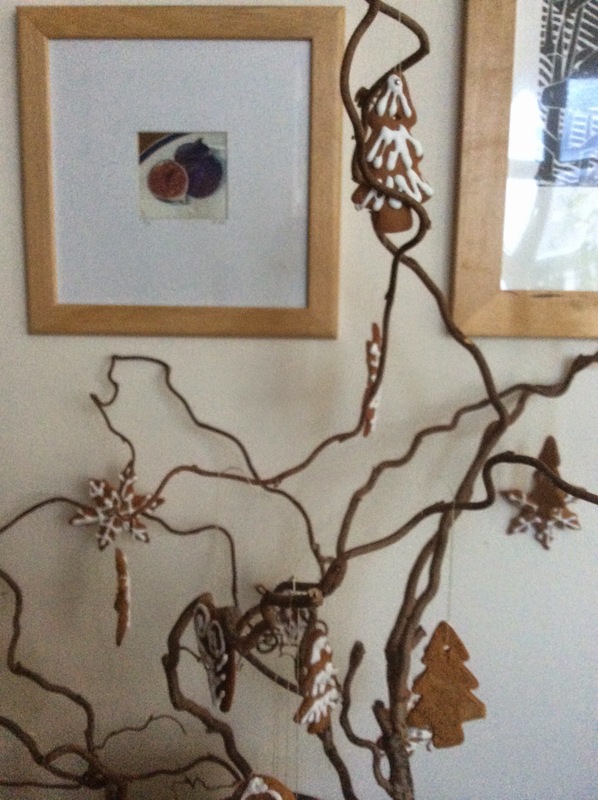 The stage was covered with what looked like bark chippings which could as well be autumn earth as a rush strewn floor, and the rear of the stage had sticks which looked mostly like a reed bed but also like a thicket of trees that had lost their leaves - either was wintery. The action opens with Frank Thorney exhorting his fellow servant and wife Winnifride to keep their marriage a secret until he can persuade his father to secure his inheritance. Winnifride, who's pregnant reluctantly promises after Franks assurances of fidelity. It also turns out that she's been messing around with their employer Sir Arthur Clarington - but refuses to do so any more. Frank travels home to be told by his father that the only way they can stay afloat is for Frank to marry Susan, the daughter of a wealthy neighbour, who is in love with him. So he does. Meanwhile old mother Sawyer is being accused by her neighbours of being a witch - beaten and reviled by her chief tormentor Banks she begins to curse in earnest which is when the devil appears to her in the form of a large black dog. In return for the promise of her soul - sealed with blood - he will work revenge in the villagers for her. Eileen Atkins plays mother Sawyer and Jay Simpson the dog. Both are superb. As the dog/devil Simpson is painted in the same sort of colour as the stage and wears little but a codpiece and tail. The look is reminiscent of contemporary images of the devil from church frescos and manuscripts, the effect is both threatening and comical as the plot, and Simpson, dictate. And then as a bit of light relief there are some Morris dancers led by Cuddy Banks, who will also have a brush with the dog/devil. Frank, having married Susan is struck with remorse, as well he might be, and then when trying to elope with Winnifride finds himself prompted by the devil to kill Susan and frame a previous suitor for her hand. The play ends with Frank, basically repentant and forgiven, and an entirely unrepentant but arguably far less guilty mother Sawyer both sent for execution. Cuddy Banks renounces the devil and all his works. Along with The Roaring Girl itself (or herself) this play stands out for having really interesting women at it's core - even if they aren't quite the main characters the titles suggest. Neither are particularly great plays in other respects but I'm not sure how much that matters. The Witch of Edmonton - along with The a Roaring Girl, and Arden of Faversham - is based on actual events, so shows something of contemporary opinions that doesn't always filter through the history books. It would be a better play without the Morris dancers but it would also lose one of its best scenes - an energetic but dark episode where the devil takes the fiddle and forces the cast into a frantic dance. It might not be a brilliant play, but it's brilliant theatre. What's interesting is how much sympathy there is for mother Sawyer. 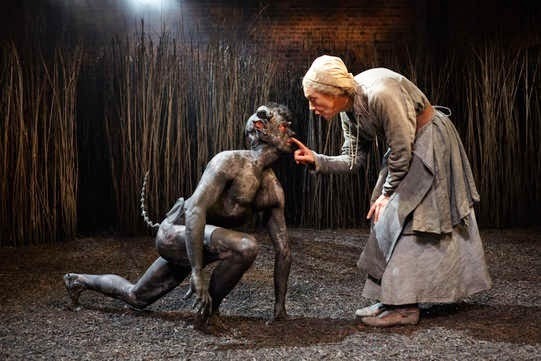 To be though a witch is basically to be a witch, alternately shunned or attacked it's no wonder she wants some revenge on her neighbours, and so she's easily manipulated by the devil, but in his guise of the dog, Tom, their relationship is as much about companionship for a lonely old woman as it is destruction. When he betrays her to her fate at the end it's his physical abandonment of her she first laments. It seems it's a far more unforgivable crime to be an old woman than a murdering bigamist. By now I think it's fair game to talk about Christmas, Christmas plans, and Christmas preparations because this is the bit of Christmas I enjoy. Over the last five years or so I've made a concerted effort to rescue some of the magic from the generally less than magical experience of working in retail when all the world seems to be throwing a tantrum about the lack of whatever alcoholic beverage they've left it far to late to buy. Just for the record if Asda is selling Baileys cheaper I'd be delighted for you to trek off to Asda and harass them instead of me. 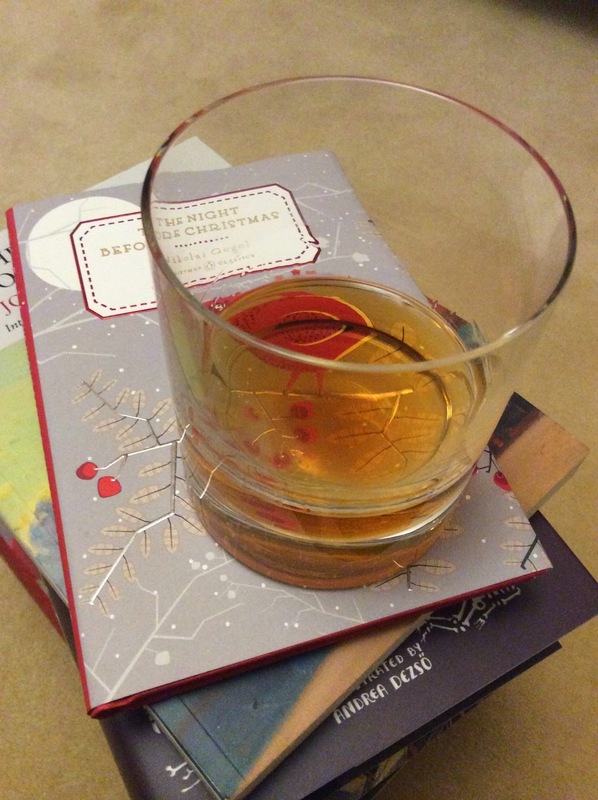 Now however is a great time to enjoy the idea if Christmas. Everything still has a bit of sparkle to it at the moment; there are plenty of nice cards to choose, the decorations look fresh (in a few shortweeks it'll be battered rejects only) and it feels like there's all the time in the world to bake cakes, make plans, and generally think about the people close to you and what gesture of appreciation you can make towards them. I hope you all like jam. With that in mind I went out into town foraging on Sunday (not a euphemism for shoplifting) where I pinched some medlars from the museum garden across the road - with a plan to turn them into medlar jelly, and found some pine branches to make what I hope will be a deliciously evocative sugar to sprinkle on things. It's possible that it will be evocative of bleach rather than actual pine forests. I hope this won't be the case. I also bought a duvet cover that will make me feel like I'm sleeping in Narnia. The medlars are strange looking things which it's hard not to regard with a certain amount of suspicion, but they're currently a beautiful colour. I gather I need to wait for them to blett (blet?) which is clearly a nice way of saying rot when they'll turn brown and squishy, so less attractive to look at. I'm looking forward to seeing what they produce even with all the warnings that they'll smell like wet sawdust and other un appealing character traits. 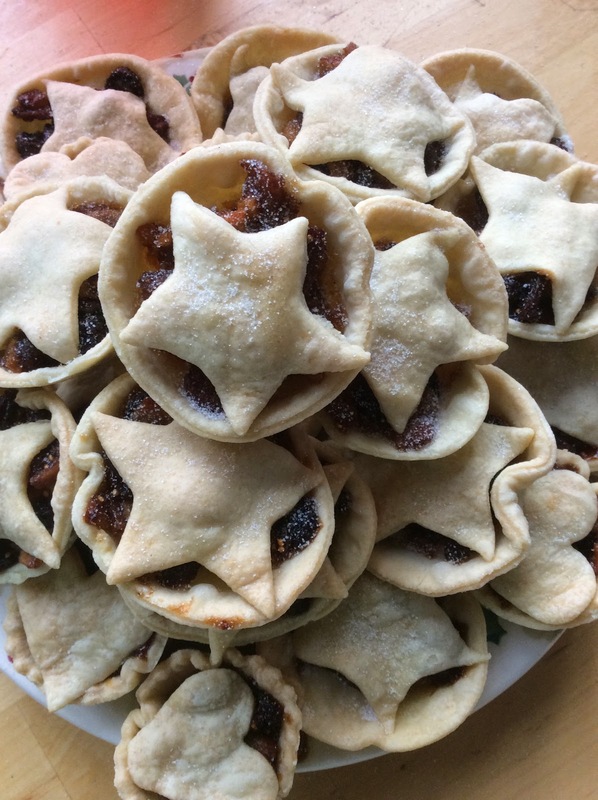 Instantly appealing is home made mincemeat. 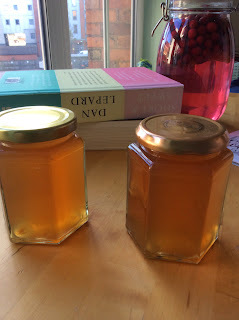 I loved the Fiona Cairns recipe I used last year so I've made another 18 jars of it (R took me to Costco where I might have got carried away with the dried fruits). This is a nice thing to make, it doesn't involve much effort, needs no cooking, smells amazing, tastes good, and makes me feel like a latter day Mrs Beeton. In short it's much better than the Elizabeth David version it took me five years to get through. 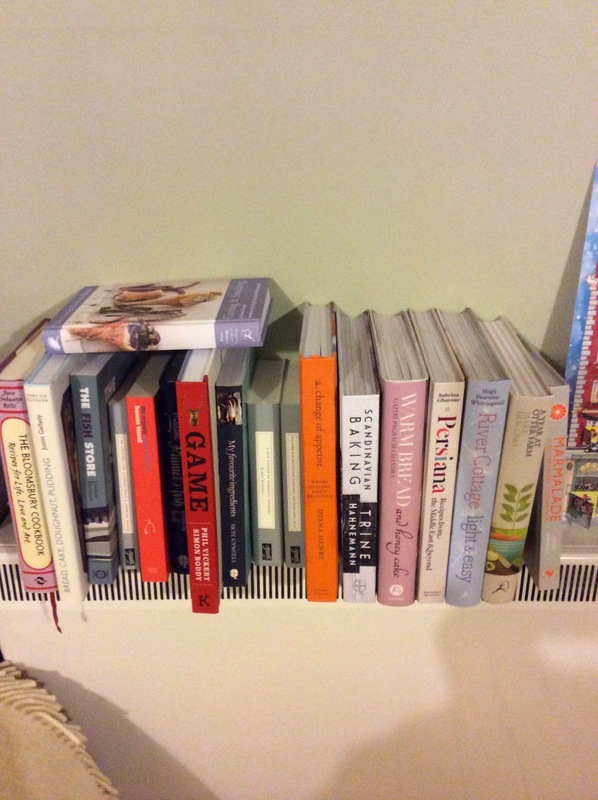 My passion for cookbooks has finally and comprehensively outgrown available shelf space in the kitchen, rogue volumes are colonising other parts of my flat where it's increasingly difficult to keep track of them, the only thing I'm sure of is that I'll probably get more. For my particular set of foody interests this has been a particularly strong year for cookbooks which is exacerbating the space problem - but when a book promises so much enjoyment how can I resist it. 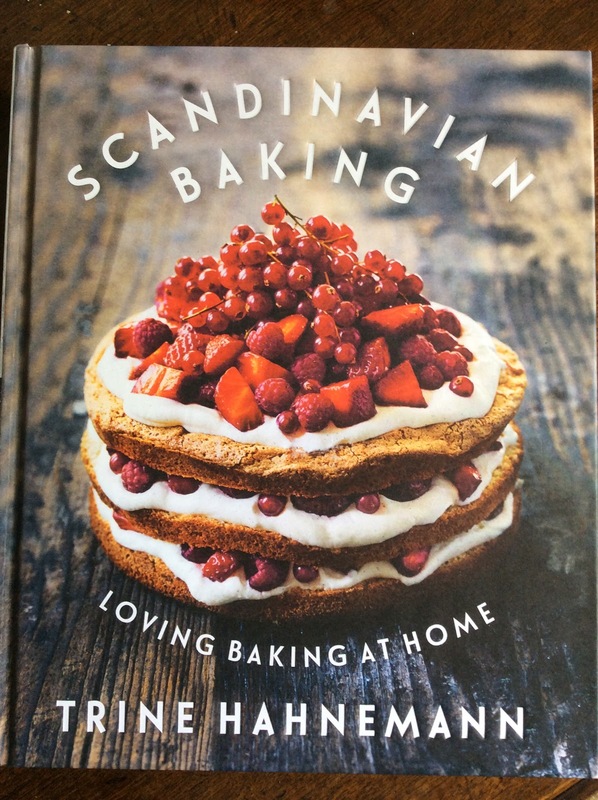 There was never any question of resisting Trine Hahnemann's 'Scandinavian Baking' (the fashions for baking and all things Scandinavian have been my friend here). What fascinates me about food is seeing how different flavours and combinations travel the world - or not, there's so much of our shared cultural history there if you care to look for it including the chance to appropriate the bits we like from other places - and in this case delicious cake too. I found a copy of Hahnemann's 'Scandinavian Christmas' in a Waterstones sale a couple of years ago, it's full of good stuff and is the reason I was particularly excited to see what she'd do with a baking book. 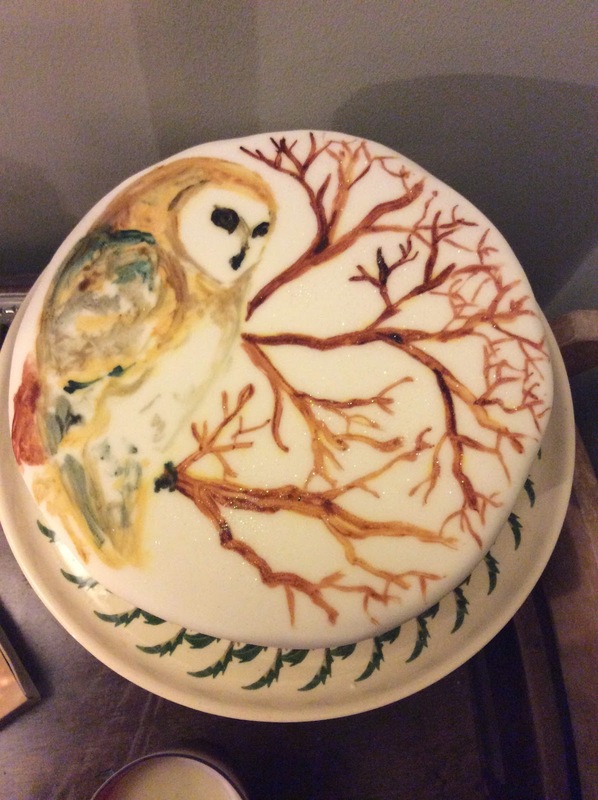 I love baking for all sorts of reasons, but mostly because it gives me a deep feeling of contentment (I do realise this isn't universal) but the sort of baking specifically, and cooking generally, that interests me is domestic rather than professional. That the extended title for this book is 'Loving Baking at Home' is another selling point for me, and that's exactly what it advocates. It's this book which has prompted me to finally get to grips with sour dough (I tried adding some starter to an ordinary loaf the other day which seems to be making it keep longer, oh but there are endless happy experiments ahead for me!) with the eventual ambition of making rye breads. There are some great looking loaves in here, so though it may take me some time to source all the ingredients for the rye breads (or at least, and typically, the ones I most like the look of) there are plenty of other things to play with meanwhile. There's also a whole world of meringue based cakes which will get further investigation. I'm firmly of the opinion that there's not nearly enough nutty meringues in my life. I made mini versions of one pavlova/cake affair which sandwiches caramel cream between meringues then tops them with figs and chocolate for a Macmillan coffee morning at work. Sweet but good. 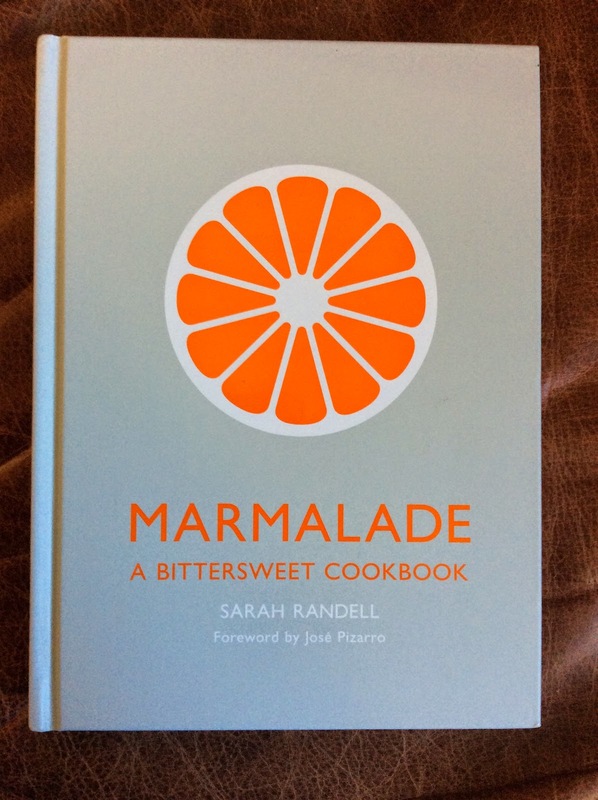 Anyone who loves marzipan (I do) will also find lots to get excited by, and this is the book which is going to make me make Danish pastries (something I've wanted to make for a dozen years or more without ever getting organised to do so). All of which is great but it's the philosophy behind it that really makes 'Scandinavian Baking' so good. To quote the introduction "baking forces us to take time out from our busy lives and, in doing so reminds us why that is necessary", it's not everybody's thing but if you want making a daily loaf of bread to be part of your life this is the book that will help you work out what sort and how to fit it in. She also talks about getting to know your ingredients. I had never really considered this in relation to flour before but it makes a lot of sense. I'm going to give it a bit more thought now, especially as I make more bread where the quality of the flour is going to be most noticeable and no longer assume that all strong white flours will be much the same. 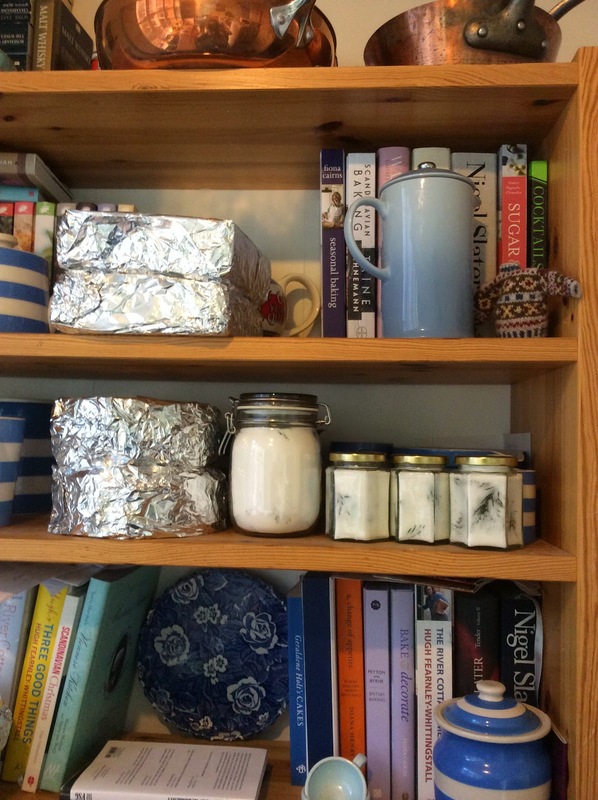 All in all a thoroughly exciting and inspiring baking book which is more than worth the effort of finding a space for in my poor, tiny, overcrowded, kitchen! I've read a few of the British Library crime classics now and enjoyed them all but 'Mystery in White' is without doubt the best so far. 'A Scream in Soho' for example is fun to read and has some interesting things to tell us about wartime attitudes but it's also unashamed pulp with some exceptionally non pc attitudes - I didn't feel like I had to make excuses for it, but there's a but to add to that. The same but that I end up applying to a lot of older fiction; attitudes change. With 'Mystery in White' there's much less of that sort of thing, and it's just generally classy which makes it very surprising that he's been so comprehensively forgotten. Dorothy L. Sayers said Farejeon was "quite unsurpassed for creepy skill", based on this one she was bang on the money. The subtitle is 'A Christmas Crime Story', if I thought for a moment I would be let alone for long enough on Christmas or Boxing Day I might have saved it, it would also be the perfect stocking filler (sorry to throw that out there in October) for any lover of golden age crime. Happily it's also the perfect read for a rainy autumn afternoon, especially if you time it so that it starts to get really creepy as it gets dark (easily done). It's Christmas Eve, 6 passengers are sat in a 3rd class train carriage stuck in the middle of a field in the blizzard of the century, they all have places to get to and are debating the wisdom of trying to set off cross country for the nearest branch line. It's that or face spending the night on the train. The decision is made when the oldest occupant notices something in the snow and ups and leaves. 4 of the remaining passengers (a nice middle class brother and sister, a chorus girl, and a clerk) promptly follow, but a middle aged bore stays behind. After a while floundering around in the snow it's beginning to look like a very bad decision indeed when through the increasingly bad blizzard they almost stumble into a house. 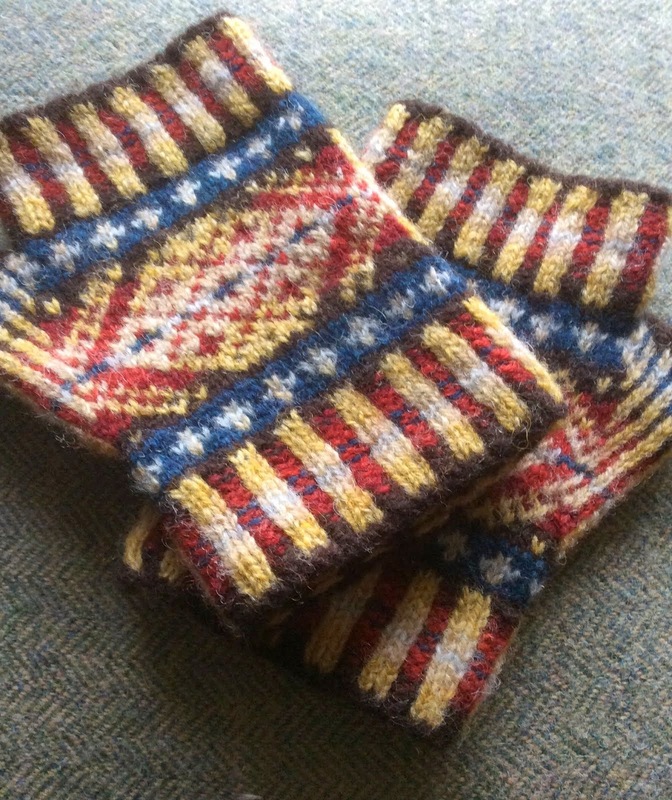 The door is unlocked, the fires burning, a kettle boiling on the hob, and a table set for tea. And nobody is home. Mystery is piled upon mystery, the group are entirely cut off from the world by the snow (and the lack of a phone) and there are hints of something supernatural. Farejeon is clever about this, he doesn't overplay it so I had no idea until the end if it was going to turn into a ghost story or not. Even at the end it's not altogether explicit - there are some plot points which hinge around potentially psychic revelations but they could be explained by the power of suggestion on an overwrought imagination. Otherwise it's up to the reader to decide exactly what they want to believe. The mystery is full of twists and turns which is all very satisfying but it's also a book which made me laugh (intentionally). The thing that really sets it apart though is how Farejeon chooses his characters. They're all reasonably ordinary people, no aristocratic detective appears, no one does anything especially glamorous for a living, and the chorus girl and the clerk are the ones we get some real insight into. The clerk lives mostly in a fantasy world to escape his dull job - he dreams of rescuing an aviatrix from a crashed plane, and the chorus girls views on life, love, and sexual harassment are - well they're real. Both are treated with a respect that's subtly different from so many books of this type. Altogether then this is the complete package; plenty of tension and suspense but with a sense if fun, lots of atmosphere and twists and turns in the plot, a mystery which keeps you guessing not just about whodunit but also about what's actually been done, and particularly well drawn characters. I'm hoping it's the first of many Farejeon's the BL will reprint, it seems he was fairly prolific so it's reasonable to assume there will be at least a few more gems in his back catalogue. 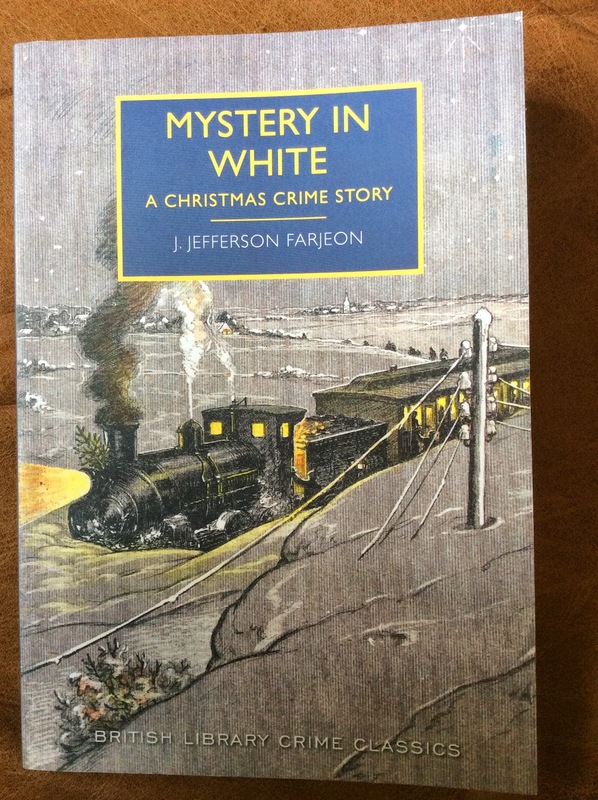 A search on amazon didn't turn up much that was affordable so for now I'll be pinning my hopes on charity shops and that 'Mystery in White' sells in such quantities that he's generally put back on the map. I've been here for just over 5 years now and although posts about the nature of blogging (as I see it) aren't really my thing every so often it's probably as well to give it some thought, not least because Desperate Reader accounts for quite a lot if my time. 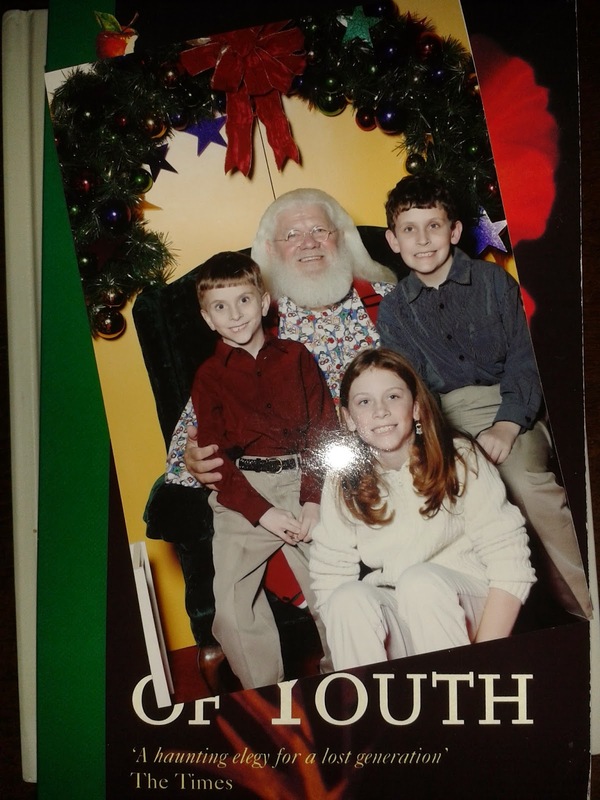 I started blogging towards the end of a particularly trying time. There was a series of woeful work, health, and mortgage insurance issues followed by a year when all I could find was part time work. It left me with virtually no money and lots of time - which in some ways was wonderful, but also horribly uncertain. The wonderful part was that for the first time in years I could read as much as I wanted. 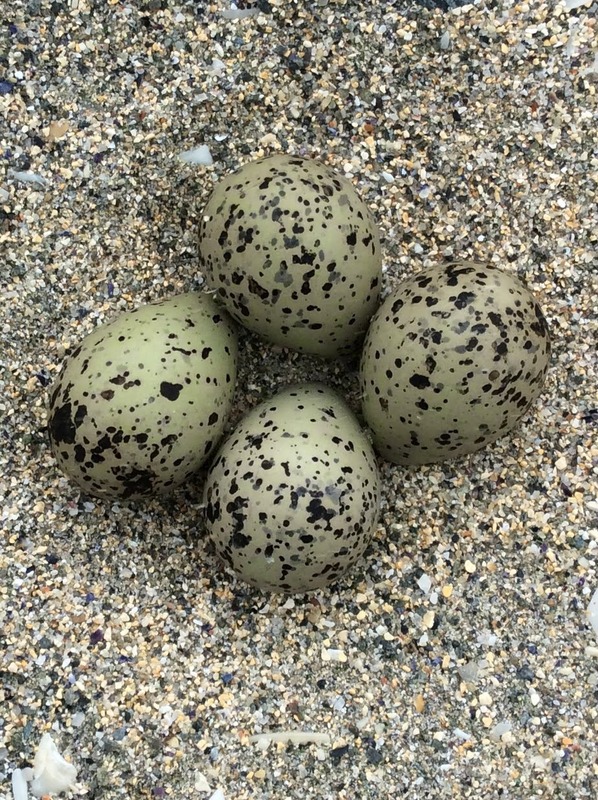 The uncertain bits don't really need dwelling upon. Blogging turned out to be a really positive thing to do in all sorts of unexpected ways, but I also decided right from the beginning that I wouldn't write about things I didn't feel genuine enthusiasm for. I sometimes see discussions about why there are so few negative reviews on blogs but I'd be more surprised if it was the other way round - why promote (even in a small way) something you're ambivalent about? And then I read almost purely for pleasure so if I'm not enjoying a book I'll abandon it; accepting the challenge of wading through 800 odd pages of Trollope endlessly repeating himself only works for me because I love him enough to know the effort will be rewarded. Having decided that it was basically going to be books I loved it then seemed unnecessary to state where they came from. Initially because they mostly came from charity shops or had been sitting on my shelves for years, and later because the source of the book is irrelevant to what I think about it's contents so unless there's some sort of anecdote attached it feels unnatural to mention it. 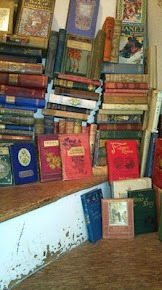 I do get free books though, some I'm offered, some just appear (as if by magic) and from time to time I'll beg for one. Asking a publisher for a book has never stopped feeling like begging, and I've never got past feeling like I've got away with something when they say yes. I have to be fairly certain I'll love something before I ask for it because having asked it seems only fair to read and write about it in a timely fashion, the one time I really didn't much like a book I'd got that way I felt like I'd broken a contract. The publicist on the other hand wasn't at all bothered. 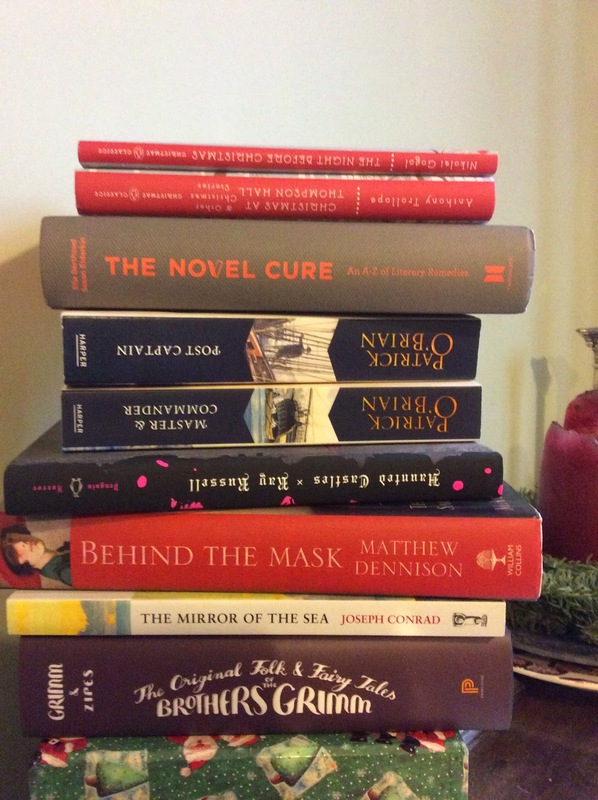 Blogging feeds a book habit my wages most certainly wouldn't cover, but keeping it manageable is sometimes a challenge. In the general scheme of things I don't get sent a lot of books, but I get about as many as I can read so inevitably I end up writing more about titles I've been given then ones I've bought. Luckily (for me) I quite often get offered books I would almost certainly have bought eventually - this makes me ridiculously excited and happy. Last week there was an article in The Guardian where the author Kathleen Hale wrote about a blogger she had a run in with. A negative review led to a slightly unhealthy obsession on Kathleen's part which in turn led to the discovery that the blogger wasn't who she said she was. It all sounded exhausting. As someone who mostly reads books written by people who died a while ago this is foreign territory to me, there's no downside to a passion for the classics and books which have generally survived the passage of time and fashion. Just recently I've read a handful of books by people who are not only alive but also on twitter, it's been very disconcerting realising they've seen what I've written. When I started doing this I assumed my family would read it (because I made them) and bookish friends because they might want to. It remains mildly surprising that other people have found their way here too, nice people, people I've come to like very much - the longer I spend on this post the luckier I feel. Still, I always write with the idea that my dad reads this, it's a handy reminder to be polite (my father appreciates/demands good manners), not to exaggerate to wildly, and to avoid anecdotes which might lead to awkward conversations with concerned patriarchs. And that is as close as I'm ever likely to get to a review policy. Marc Pastor works as a CSI in Barcelona as well as writing, this is his first book to be published in English and is a belting price of gothic horror. Set mostly in the slums and back streets of Barcelona in 1911 it recreates a nightmarish world of over crowded, stinking buildings, grinding poverty, prostitution, crime, violence, and any number of other horrors. The city is uneasy, the streets feel volatile, and to many people have seen to many unpleasant things to be anything other than damaged by the experience - morals are a little lax. Even so rumours that the children of prostitutes are disappearing into the hands of some monster are troubling the detective Moises Corvo. When he starts to investigate it gets even more troubling, his bosses aren't keen for him to look into the matter - the disappearances aren't being reported and there are more pressing matters at hand, and then when Corvo pokes his nose into some of the more upmarket brothels and casinos there are very clear warnings to drop it. Warnings it's dangerous to ignore. Meanwhile Corvo isn't the only one investigating, our narrator is Death, who takes an understandably unemotional view of the whole situation, but who also has enough curiosity to untangle the story for us as Corvo tries to find his monster. The discovery of a body drained of blood gives rise to rumours that a vampire may be stalking the streets, and the discovery of another body, decapitated and robbed from a grave doesn't make it any easier for the police to piece together what's going on. Death leads us to Enriqueta Marti who is leading the oddest of double lives. She has been a prostitute, a herbalist, a procuress, she turns up in the mist unexpected places, and she's stealing children for truly unspeakable purposes. 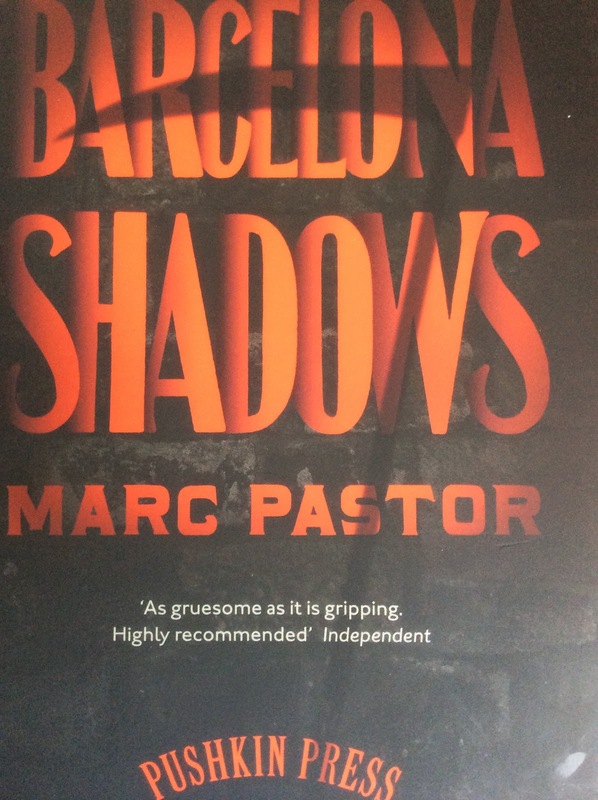 It wasn't until I finished 'Barcelona Shadows' that I realised it might be based on actual events. A couple of minutes research online reveal the whole story of the 'Vampire of Barcelona', so basically spoilers for the book - finding out at the end how much was true certainly added a layer of horror to the whole narrative. Facts about Enriqueta are hazy, the remains of her victims don't truly reveal her motivations, which gives Pastor plenty of room to weave fiction with history. He opts for the blackest of humour and a straight up horror story, which is a definite strength of the book. Sometimes we need monsters, or at least the explanation that there are monsters out there because the idea that people can do these things is to much to really accept. Pastor's Enriqueta with her claw like hands, mesmeric presence, and the sense of disquiet that she arouses in people isn't quite human, turning her into something a bit more mythical (and not unlike the witch from Hansel and Gretel or even Baba Yaga) doesn't diminish the horror of what she did but maybe it makes it easier to assimilate. Either way this is a terrific book. Very dark, never gratuitous in it's details, and clever enough to lay out social injustice and then leave the reader to draw their own conclusions - there is more than one sort of monster here. It's very much a story for lengthening nights and a cosy sofa, it will probably also make you check that your door is locked. About 14 years ago I bought my first book about bread; Tim Allen's 'The Ballymaloe Bread Book' (in case you wondered) from it I learned to make soda bread. Soda bread is brilliant, essentially it's a huge scone so it's quick and easy to make and for a few years it's what I stuck with. It was just the thing to put in front of people - it looks far more impressive than the effort required, is delicious, and can be thrown together not long before you need it. 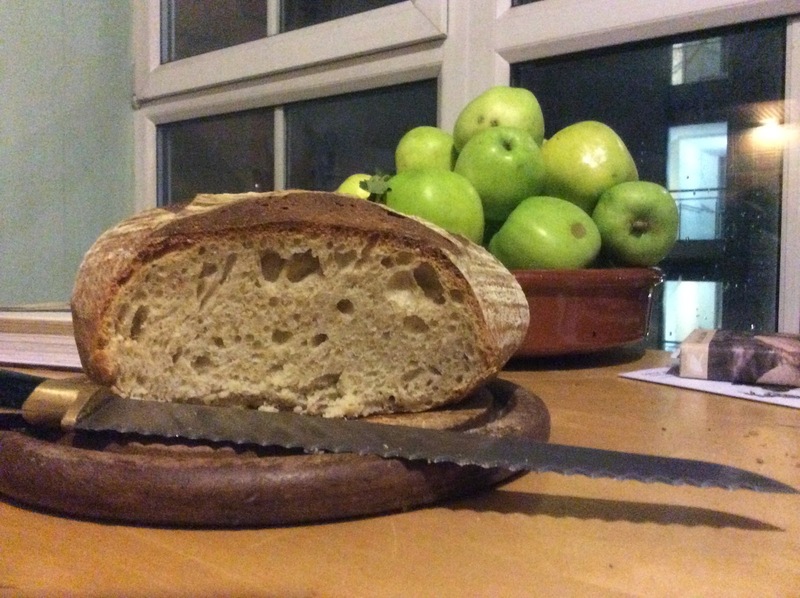 It's also the first place I read about sourdough (14 years ago in Leicester that was fairly exotic), naturally I wanted to try making it, and equally obviously I didn't quite get round to it. There were flirtations with yeast based breads over the next few years but nothing serious until 2009 when I bought Daniel Stevens 'Bread', it's one of the River Cottage handbooks and is the perfect book on the subject for me. It has been known to come on holiday with me (when I go to stay with the Aga) and it persuaded me it was time to properly get to grips with bread making. So I did - or at least I learnt how to make a decent loaf of fairly plain bread. The pleasure of bread making is partly in the sense of it being a living thing that you get to know; changes in texture as you knead it, the way different flours will make it behave, seeing how it rises. It's also in how it imposes it's own pace on you. Looking at the list of ingredients on a mass produced loaf of bread and comparing that to the basic components of flour, yeast, salt, water, and a drop of oil that go into the loaf you make yourself made me basically stop buying bread. Not completely stop (I'm not evangelical about this) but the typical loaf of sliced white no longer tastes right to me (far to sweet) so it's no longer a staple, and then if I'm at home bread making is easy to fit around the general domestic demands of life and such a satisfying thing to have done at the end of the day. A couple of weeks ago I bought Trine Hahnemann's 'Scandinavian Baking' (a lush and lovely book) and read some more about rye and sourdough breads which got me thinking about them again. Knowing that I had this week off was the perfect opportunity to actually do this thing after all those years of thinking I ought to have a crack at it. So I did. What I really wanted to have a crack at was a rye loaf filled with seeds and cracked rye, but finding some of the ingredients has proved overly challenging. Thankfully wild yeasts are easy to catch, so following the instructions in 'bread' I mixed a nice organic stoneground wholemeal flour with some water, waited more or less patiently for it to start to ferment - which obediently it did - fed it, changed it, fussed over it, cooled it down, and warmed it up, and finally on Tuesday night started making bread with it. First a nice sponge with more flour and water along with some starter to be left overnight, then a dough which I carefully allowed to rise, and then deflated 3 times over the required 4 hours, by which time it was indeed 'like an angel's pillow' as promised. Then it got another few hours to rise again before making it into the oven from where it later emerged as a delicious, crusty, chewy, loaf complete with the approved air bubbles and a complex but pleasing flavour (not to sour) and only slightly over baked. Making sourdough is clearly a commitment. If you have to do it I suppose that might be a bit of a pain, but as a leisure activity it's immensely relaxing. You have to wait for it so there's plenty of time to read, drink tea, and generally ignore the world. I'm making more tomorrow. I've been told that using the British Library as a library can be a challenge, never having had to try I can neither confirm or deny that information, but as a tourist destination it's amazing. An English teacher friend persuaded me to visit with her about a decade ago, since when it's become a favourite destination; it has a lot to recommend it. First off it's very convenient for St Pancras (where I get on and off the train) so it's very easy to fit in a quick visit on the way to or from other things. Then it's well supplied with cafés, comfortable places to sit, a peaceful atmosphere, and toilets you don't have to pay to use or queue for ages for. Physical needs met, the permanent (free) exhibition of treasures is very good indeed, and the gift shop is basically a very nice bookshop (what's not to love). And then there are the exhibitions. This Gothic show is the second I've seen at the BL (the first was the Georgians at the beginning of the year) and it's confirmed that their exhibitions are another thing to love them for. As much as I'd like to see the Rembrandt's at the National the really big blockbuster exhibitions aren't always much fun to look at, mostly because so many other people are trying to look at the same time that it's really hard to see anything very much. 'Terror and Wonder' was by no means empty when I went (about 11am on a Tuesday morning) but quiet enough to really look at things, read about them, listen to the audio clips at various points, go back and look again, and generally take it all in. Consequently I spent a lot longer going round this exhibition than I normally do and feeling like I'd got rather more from it than I might generally expect. The set up worked for me too, I like the space used for these exhibitions, in this case broken up into a series of rooms partly through the use of floating black muslin curtains (very atmospheric) and the occasional bit of dramatic velvet. The lighting was good, the colour scheme effective (an attractive Strawberry Hill appropriate blue leading into sepulchral black, a nice juicy crimson, and finally a stark white, all of which helped mark different developments in our gothic imagination) and effective film and audio clips. It all starts with Horace Walpole's 'The Castle of Otranto', the first Gothic novel - though even this has it's roots in a much older tradition (the exhibition draws specific links to Shakespeare, Spencer, and others). It then moves on to the likes of Ann Radcliffe, concerns around the French Revolution, the works of the Minerva Press (my favourite single exhibit may have been the collection of Northanger Horrids - the 7 titles Austen mentions in her Gothic parody) and a look at some aspects of the romantic poets work. After that it's the Victorian take on Gothic with penny dreadfuls, Christmas ghost stories and a move into a more urban contemporary setting - the dark streets of London slums rather than unlikely Italian castles before bringing us up to date with the popularity of the Twilight saga, zombie mash ups, and goth culture. 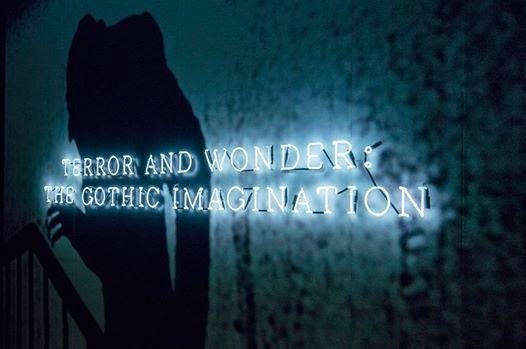 This is an exhibition with a sense of humour (a vampire slaying kit would be my second favourite exhibit) which does an excellent job of charting our flirtation with the dark side of the imagination and some of the directions in which it's flourished. There's a lot to think about here with the definite bonus that an exhibition based around the contents of a library comes with an obvious (and enjoyable) reading list. Disgorged back into the gift shop there's a whole pile of books for sale to consider so you can really immerse yourself in the experience, in some ways it feels like a continuation of the actual exhibition, as does the view of the St Pancrass hotel as you leave the BL. I really recommend it, tickets are £10 for adults - it was money well spent. 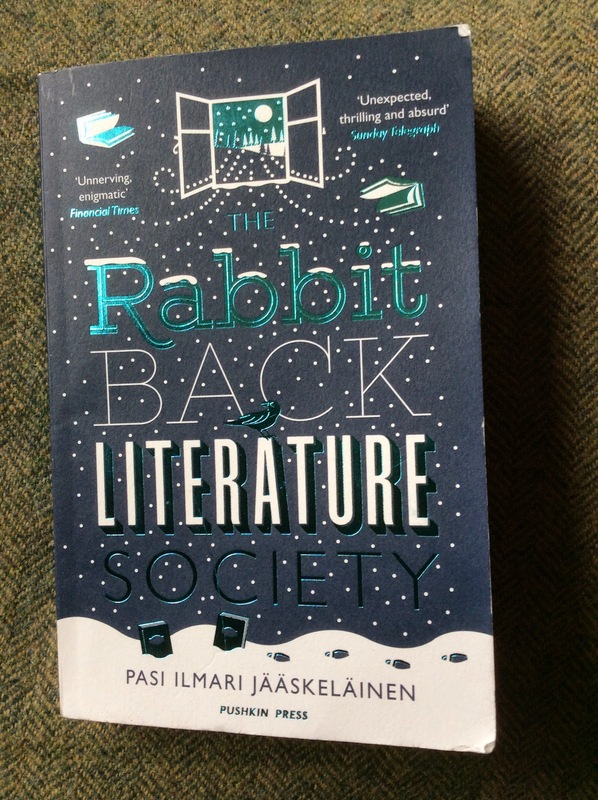 When 'The Rabbit Back Literature Society' landed on my doorstep I had no idea who had sent it, the mystery was only cleared up a week or two later when I realised that Salt and Pushkin Press share a publicist. Initially I thought it looked mildly interesting, based entirely on enjoying the 2 Finnish novellas that Peirene have published (The Brothers and Mr Darwin's Gardener) and thought no more about it, but after a brief email exchange with Tabitha (the publicist) I promised I would actually read it (and soon - she's very persuasive). I'm glad she gave me a bit of a push because after a slowish start I was utterly absorbed by 'The Rabbit Back Literature Society' which was something of a departure from anything I remember reading over the last few years. I'll start with the things I didn't like so much about this book - which are superficial - the first is the book cover and title. Before I read it both seemed to me to suggest something altogether cosier then the book turned out to be. Now I have read it both make sense but I would still prefer something that captured a little bit more of the weirdness inside. Second is that this translation is full of Americanisms which is fair enough when the translator lives in Seattle but is oddly distracting for me in a book which I want to feel totally European (by which I probably mean British, but I notice the use of 'parking lot' or 'block' in a way that I wouldn't 'car park' or 'street'). For Ella Milana it's all a bit much, personally it was where the book really started to get its hooks into me. There are so many questions at this point; what's happening with the books, who and what is Laura White, why has she picked Ella Milana, were the gnomes real, and most crucially - what will happen next? Without giving to many spoilers Ella Milana learns that she's not the first 10th member of the society, that nobody seems to be very clear about what happened to that first 10th member, and that her disappearance might not be the strangest thing about Laura White. She also learns about The Game, a method that Laura White devised for her students to plunder each other's experience to put in their own work. Ella Milana decides to use the game to get answers, but it also means giving answers. Participators have to spill, they're not allowed to tell a story, instead they have to tell what the listener accepts as the truth, and can only stop when they do accept it as truth - no matter how personal or painful the experience might be. As they're allowed to use force when they deem it necessary physical pain is on the cards too. What becomes clear is that the truth as recounted this way is still subjective, it's always filtered through the memory and perception of the teller, never quite frees itself from story or myth making. It also emerges that Laura White's methods weren't always particularly wholesome; her pupils may have grown up to be successful but they're also quite badly damaged, the question for Ella Milana is are they damaged enough to have committed a murder. As a mystery novel it's absolutely bloody brilliant with a conclusion that's horrifying for entirely unexpected reasons, but it's not just a thriller. There is also an element of magic realism; fairy tales in the Grimm sense. 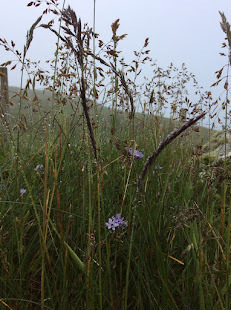 The changing books, dogs behaving oddly, those gnomes (also elves, sprites, nymphs, phantoms and nixies), and Laura White herself all hint at another world but in such a way that the reader can dismiss it as some combination of dream, superstition, and imagination or accept it as they see fit. Pasi Ilmari Jaaskelainen offers a guide to unlocking his intentions here which I haven't followed (yet) because for now I prefer to mull over my own take on his writing, but at some point it would be interesting to read the passages he highlights to see if they clear anything up (I suspect maybe not, but as it's the ambiguity of the book that I particularly liked, that's okay). Pretty much everything happens through late autumn into winter, it all ends in spring. It's very much a story of long, dark, cold nights where everything is obscured by snow, made unreliable by ice, and the forest is a dangerous place to go. As for the forest, it feels like very old stories have crept out of it to make their mark on this novel - which I find very exciting indeed, so once again a big thank you to Tabitha for persuading me to read it so promptly.